This model is no longer available or might have limited distribution. Height: 41 in. Width: 29 in. Depth: 33 in. • Manufacturer recommends low-sudsing detergent. • Comes with a 1 year warranty. 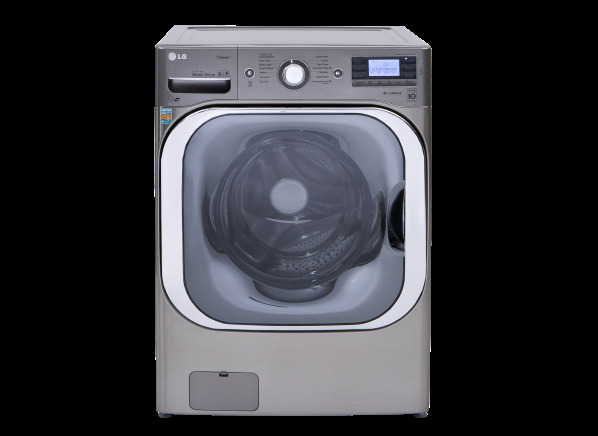 The LG WM8500HVA is part of the Washing machine test program at Consumer Reports. In our lab tests, Washing machine models like the WM8500HVA are rated on multiple criteria, such as those listed below. Energy efficiency: This score is based on the energy needed to heat the water for 8-pound loads using a warm wash and cold rinse. We consider both gas and electric water heaters, and include electricity needed to run the washer and energy needed for drying. Washers that extract more water are scored higher. Water efficiency: This score denotes how much water it took to wash our 8-pound load. On models that didn't set the fill level automatically, we used the lowest fill setting that sufficed for the 8-pound load. We then calculated water used per pound of clothing. Results in the following chart are gathered from Consumer Reports’ 2018 Fall Survey of 32,447 front-load washers, owned by members who purchased a new machine between 2008 and 2018. Our predicted reliability ratings are based on a statistical model that estimates problem rates within the first 5 years of ownership, for washing machines that are not covered by an extended warranty or service contract. We also adjust for the median number of loads of laundry run through the machines per week. The median in our survey was 5 loads per week. Higher ratings are indicative of better reliability. Brands receiving a red or orange rating cannot be recommended by CR at this time. Our owner satisfaction ratings are based on the proportion of members who are extremely likely to recommend their washing machine to friends and family. Stainless-steel tub Stainless-steel tub Tubs constructed of stainless steel are likely to be more durable than plastic or porcelain, and they allow for higher spin speeds. Plastic is the next most durable choice. Auto temp. control Auto temp. control This feature automatically mixes hot and cold water to reach the chosen wash temperature (which differs on various makes of washers). It's a good way to compensate for normal variations in tap-water temperature and prevents problems caused by water that's too cold, which keeps detergent from working properly. Auto bleach dispenser Auto bleach dispenser Automatic Bleach dispenser releases the bleach at the proper point in the cycle, giving the detergent additives sufficient time to work. Auto detergent dispenser Auto detergent dispenser Automatic Detergent dispenser releases the detergent at the proper point in the cycle. Auto fabric softener dispenser Auto fabric softener dispenser Automatic Fabric Softener dispenser releases the fabric softener at the proper point in the cycle. Extra rinse cycle Extra rinse cycle This feature can be useful for those with a sensitivity to detergent and others who find one rinse insufficient. End-of-cycle signal End-of-cycle signal Sounds a bell or chime when the wash is done. Useful when the washer is in the basement or garage, or otherwise out of sight. On some models you can turn off the signal or adjust the volume. Steam option Steam option This feature injects steam during parts of the cycle and is intended to improve wash performance. WiFi WiFi This feature offers remote access through a wireless network. The specific functionality varies by model but can include options like problem detection and start/stop or cycle selection choices. Deep Fill Deep Fill Offers the option to add additional water to the wash cycle. Energy star Energy star The federal Energy Star program, administered by U.S. Environmental Protection Agency and the U.S. Department of Energy, identifies a wide range of home appliances that use 10-50% less energy and water than standard models. These appliances can help you use less energy at home and save money on your utility bills. Type Type Front-loading washers -- With a door located on the front of the washer, one needs to stoop in order to load it. Front-loaders get clothes clean by tumbling them into water. Clothes are lifted to the top of the tub, then dropped into the water below. This design reduces water and energy use and makes front-loaders gentler on clothing and more adept at handling unbalanced loads. Be aware that front-loading washers give best results when used with high-efficiency detergent, which produces fewer suds than regular detergent. They're typically 27 to 29 inches wide. Conventional top-loading washers -- With the opening on the top of the washer, top-loaders are somewhat easier to load than a front-loading washer. Most top-loaders allow you to fill the tub with enough water to cover the clothing. Because they need room to move the laundry around the agitator to ensure thorough cleaning, these machines have a smaller load capacity than front-loaders. They're typically 27 to 29 inches wide. Unconventional top-loading washers -- These look much like conventional top-loaders on the exterior, but these machines typically replace the usual vertical agitator post with other wash mechanisms, such as disks or plates that lift and move clothing around the tub. They generally use less water, and thus less energy, than conventional top-loaders and often have a larger capacity. They provide best results when used with high-efficiency detergent, which produces fewer suds than regular detergent. They're typically 27 to 29 inches wide. Stackable Stackable Some washers with front controls can be installed with a suitable dryer stacked on top, to save space. A special kit is sometimes required to mount the dryer on top of the washer. Dimensions (in.) Dimensions The exterior measurements of the washer with the door or lid closed, in inches (height x width x depth). Be sure to allow a few extra inches of clearance in the rear for hoses and connections. Requires HE detergent Requires HE detergent Manufacturer requires High-Efficiency (HE) detergent. HE detergents are formulated to produce fewer suds, and dissolve more efficiently to improve washing and rinsing performance. Warranty Warranty The length of time the washer is covered by its manufacturer for defects or repairs. Oops! You no longer have digital access to ratings and reviews. Reactivate now to get the information you were looking for! You will get digital access to reviews and ratings for over 8,000 products and services to help you make better choices for life’s big moments and the everyday ones in between. If you feel you have received this message in error, please view our customer care FAQs or access your account information here.